We’ve discussed triage healing in the past, DPS using Lightwells, and using the right spells in the right situations. Does this mean, “Do X people, in the same group, have a health deficit that would be reversed by a well placed Prayer of Healing?” Yes, it does. In many Heroic Encounters, you will see your entire raid take massive amounts of damage and casting Prayer of Healing followed by a snap of COH can quickly top many folks off… but healing and knowing your priority is much more than that. … even for “Raid Healers”. Is keeping your whole raid alive a bad thing? No, of course not. Healing up your raid-mates is a huge part of your job as a Raid Healer. You need to be certain that all (or most!) of your raid survives until the end of the encounter. That is arguably the biggest part of being a Raid Healer. HOWEVER— The most important thing for all healers (Raid Healers, or otherwise) is the livelihood of the tanks. If the meat-shields die, the raid (in all likelihood) will fail. This means, even the Raid Healers need to be sure they are assisting the Tank Healers. This can mean more than just “keeping a renew” or “bouncing your Prayer of Mending” off of the tank. This could very well mean casting a Greater Heal on one of the tanks after a big surge of damage. A great example is just after an Electrocute (aka “Crackle”) goes off on Nefarian: being sure that ALL of the Raid Healers were healing up the tanks after Electrocute was pivotal in my guild’s success in our recent Heroic Nef kill. Your raid should not be taking massive amounts of damage just after Electrocute hits, and you should have more than enough time to heal them back up— AFTER you insure that the tanks are topped off. Sure, you could queue a POH to land just after Eletrocute strikes, but queuing a GHeal to land bringing your tank to safety before managing the rest of your raids HP is likely a much better use of your time. (Remember there are likely “active” 2 tanks, one on Nef and the other on the Bone Constructs). Of course, there will be exceptions to this rule; when the tanks will be safe (Word of Glory, ahem Meloree) and/or the raid will be constantly taking damage and clearly defined “Tank Healing” and “Raid Healing” roles will be defined– but ultimately, your tank is your raids lifeline. Chasing those “big numbers” on the meters can often be very easy for a Raid Healer to do, especially when there is lots of damage going out– taking a split second to heal the tank can mean the difference between the raid wiping and the boss going down. Do you remember to heal your tanks or do you just rely on your designated “Tank Healers” to do that? 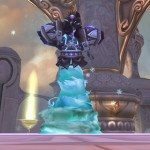 Do you have any other examples of when your tank should have priority over the raid for heals from your “Raid Healers”?